YUHONG SPECIAL STEEL deal with Austenitic Stainless Steel, Nickel Alloy Steel(Hastelloy , Monel, Inconel, Incoloy ) seamless and welded pipe and tube already more than 25 years, every year sell more than 80000 tons of steel pipe and tube. Our client already cover more than 45 countries, Like Italy, UK, Gernmany, USA, Canada, Chile, Colombia, Saudi Arabia, Russia, Korea, Singapore, Austrial, Poland, France , ....And our group branch company and factory have been already approved by :ABS, DNV, GL, BV, PED 97/23/EC, AD2000-WO, GOST9941-81, CCS, TS, CNNC, ISO9001-2008, ISO 14001-2004.
critical felds---Nuclear And Petrochemical Machine Building. 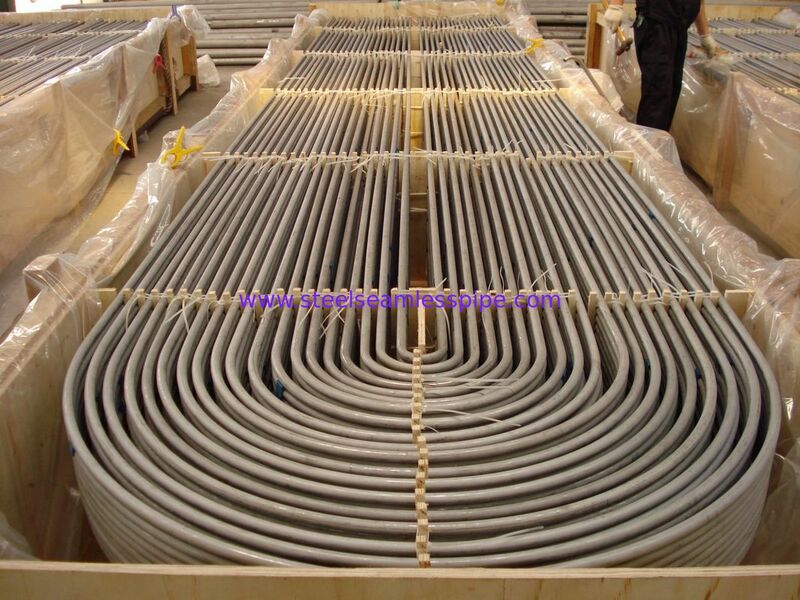 30000 tons Stainless Steel U Bend Tube to 35 countries. Tube Of Other Alloys And Steel Grades Can Be Produced Upon Agreement. ASME SA 213; ASME SB 163; ASME A789, ASME SA268, ASME SA269, etc. Note: Marking is also possible After Bending On The Straight Parts Of U-Bending Tube. -TEMA RCB 2.31 Standard Of The Tubular Exchanger Manufacturers Association (9th Edition). Steel Grade Designed For Feed Water Boilers. When Ordering Tubes With Radius less or equal to 1.5*OD, It Is Necessary To Agree Precision Of Geometrics. Straight Tubes Maximum Length:(Before Bending): 35000 mm. Note: Other Size Are Available Upon Agreement. Heat Treatment: Stress Relieved After U-Bending (Bending Area Plus 300MM For Each Leg). Dematerialized Water. Compressed Air Cleaning After Hydro-Test. films With soft plastic caps on both end of Tube. 'U' bending is done by cold working process. 'U' bending is done to the required radius as per customer drawings. The bend portion and six inch leg is stress relieved by resistance heating. Inert gas (Argon) is passed through it at the required flow rate to avoid oxidation in ID. The radius is checked for its OD and wall thinning with the recommended specification. The physical properties and micro-structure is checked at three different position. Visual inspection for waviness and cracks is done with Dye Penetrant Test. Each tube is then hydro tested at the recommended pressure to check for leakage. Cotton ball test is done to check the ID cleanliness of the tube. Thereafter pickled, dried, marked and packed. All procedure is strictly followed as per TEMA "C" and ASTM A-688.